What you create is who you are. Slick is designed for the people who have the love for excellence, believe in excellence and love to create impressive things that stand out. 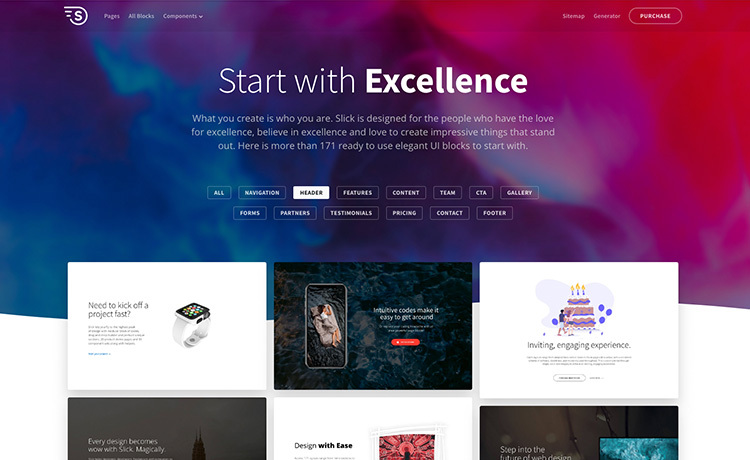 Here is more than 171 ready to use elegant UI blocks to start with. You shouldn't need to read a review to see how nice and polished this theme is. So I'll tell you something you won't find in the demo. After the download I had a technical question, emailed the team and got a response right from the team CEO with helpful advice. And that's why I'm taking the time to leave a review! Just click through on all the pages, you will see plenty of examples you cane use to start your own landing page or application website. I uploaded all to my server then open the generator.html page but can not drag and drop any block to right side, why ? I have personally contacted you on chatra, so, hope your problem is going to be solved soon. I want to purchase this but I would like to know how can I bundle everything into a WordPress theme. You can’t make WordPress theme using slick and sell it. We we will continue to update our product. Though I can not give you any specific date but yes of course, at some point we are going to incorporate Blog layouts and more. Thank you for your interest in Slick. Hopefully this isn’t a stupid question – is the template generator online only, or included in the download? I guess I wasn’t clear on the question – you have a ‘generator’ for building pages from Slick – is that online, or included in the download? Yes, “Generator” for building pages is online. You can also work with it offline but in specific conditions. We recommend you to use it online. Trying to determine if I should go with Posh or Slick. The Price has nothing to do with my decision. Having said that , does Slick have more than Posh? In other words I like the drag drop generator in Slick, but I do not need it, but wondering if this masterpiece of an idea is driving price up? Or does Slick really offer more than Posh. I love them both, and just looking at them here, I am in Awe !! Just looking to get the best I can. Help me make my mind up. and none are online. This is just a crazy hobby of mine playing with them. However, wife is on me to make site for her business. Slick has more than posh – The latest version of bootstrap 4 and A lot more layouts. However, if you need only a few pages and you think posh has them all, you can go with posh. Hello，How Cloud I use CDN for js and css？I want put js and css in my CDN zone. Thank you for purchasing Slick from Themewagon. Sorry to inform you that Slick doesn’t have CDN. No worries, You can use Cloudefare for free. Feel free to ask anything in your mind. You are are most welcome Drixn. Yes, you can do that with available CDN provider such as amazon cloud front. Does the Slick have a detailed tutorial? I am in China, using Amazon’s CDN will slow down the speed of website access. With the Chinese CDN, the domain name must be filed. So I want to know if I have saved JS, CSS and images to a server, and save html files use another server? If there is a way, how should I do next? Please understand that ThemeWagon support is only for dealing with bugs and issues in the template. So, please contact the support team of whatever company’s CDN you are using. Cloud css, js, and images be represented by absolute paths instead of relative paths? How can I put my own email into the files? Is it through the PHP? Do I just replace the ‘to’ with my email? Thank you for downloading Slick from themewagon. Please feel free to ask any other question if you have. How do I add in my email so it sends me an email with a success message? Yes, Slick is our flagship product and the possibilities of creating with Slick are unlimited. Our support team will help you if you find any difficulties. Please let us know if you have any other questions or confusion. I just checked out the Slick previews and I have to admit they look extremely beautiful. I was just wondering whether your included newsletter subscription forms could also be integrated with Mailchimp?